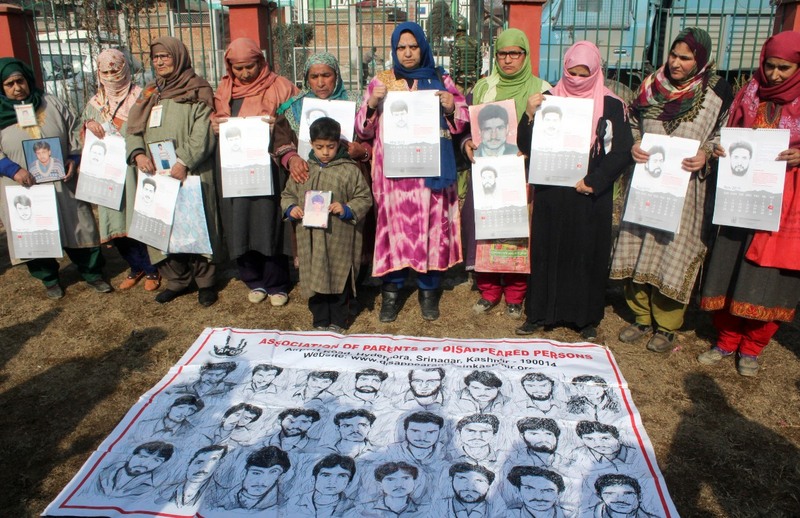 SRINAGAR: Promising to not let the memories of the disappeared persons vanish in thin air, the Association of Parents of Disappeared Persons (APDP) came up with yet another wall calendar featuring the sketches of disappeared persons on its 12 pages. Members of APDP holding wall calendars that features the sketches of twelve disappeared persons. The Association is publishing this calendar since 2016 to commemorate the memory of the persons who have disappeared in custody. It released the new calendar during a signature protest march in Srinagar’s Pratap Park. The calendar features twelve disappeared persons, one on each page representing a month in the year 2019. Instead of using photographs, the calendar has sketches of these persons and a brief description of events that led to their disappearance. Along with the sketch and a brief description, a short poem is written on the theme of ‘memory and loss,’ featuring mostly young and promising poets whose poetry is more about resistance. The month of January 2019, is dedicated to the memory of Habibullah Khan, 35, who was allegedly abducted by personnel of 28 Rashtriya Rifles. Habibullah was a resident of Janbazpora village in Baramulla district. A daily wage labourer in PHE department, Habibullah disappeared from his home at Shah Mohalla on January 28, 2000. The family filed an FIR at a police station, Baramulla. The second page carries sketch of Mohammad Akbar Lone, 35, a farmer, who was allegedly abducted on February 3, 1995, from his Lone Mohalla Bala home in Bandipora. He was allegedly taken by personnel of 14 Rashtriya Rifles. It took family four years to file an FIR in police station Bandipora. Lone’s wife is still waiting for her husband, the calendar reads. The third case featured in this year’s calendar is of Ghulam Qadir Sheikh, 35, a labourer, who was abducted from his home at Gund Kralpora in district Kupwara, allegedly by personnel of 14 Rajput Regiment. An FIR was filed by the family in police station Trehgam in August 2000. But Sheikh is still missing. Humayun Azad, 26, a businessman, and his two friends were allegedly picked up by the personnel of BSF’s 137 Battalion, from near Mehjoor Nagar Bridge in Srinagar. A year later his two friends were released but not Azad. His family still hopes that he is alive and will come home. Mohammad Ashraf Sheikh, 26, was abducted on May 02, 1990, from his home in Drangbal village, Baramulla district. His mother still waits for him. Ghulam Nabi Bhat, a tailor was allegedly abducted by 107 Battalions of BSF. He disappeared from his home in the Kandevar village of Srinagar. “You were calling among the pine trees: come, my love. Abdul Rashid Wani, 32, a driver, was allegedly picked up by the personnel of army’s 218 Grenadiers near Fruit Mandi bypass in July 1997. He was resident of Kanihama Nowgam of Srinagar. The family after repeated pleas to the police managed to file FIR in police station Parimpora in 2000. However, his whereabouts are still not known and his family is waiting for his return. In August 2001, Mohammad Saleem Bhat, 32, a labourer, was allegedly picked up by the CRPF stationed at Srigufwara in south Kashmir. Saleem was a resident of Kullar village of Pahalgam. His family still waits for his return. Mushtaq Ahmad Shah 35, a daily labourer by profession was picked from his shop at Lal Chowk in Anantnag, by the army personnel and policemen. The family filed an FIR in police station Nai Basti. He is still untraceable. In October 1996, Abid Hussain Dar, 18, was allegedly picked up by army’s RR. A resident of Narwara Eidgah in Srinagar city, he had gone to Jammu with his classmates on a school trip and never returned. Parents died waiting for the return of their son. On November 2002, Abdul Rasheed Parra, 30, a farmer was allegedly abducted from Larkipora village of Khag Budgam by personnel of Rashtriya Rifles regiment of nearby by camp stationed at Khag. His family still waits for his return. The final page of the calendar features Showket Jamaal Reshi, 19, a student of the twelfth standard who was allegedly abducted and by the army stationed at Hamray, Pattan in Baramulla. He was resident of Dhobi Mohalla Batamaloo (Srinagar).